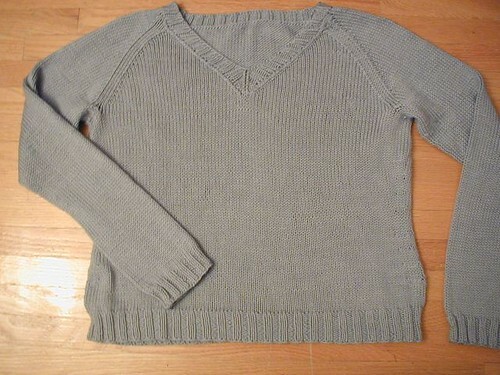 Cloud is a v-neck pullover, knit in the round from the bottom up to the neck, then the sleeves down from underarm to cuff. my bust size is 36” – this is a looser fit for me, but can work for a range of sizes depending on how fitted you want it to be. Place marker (marker A) and join for working in the round. Work in k2, p2 rib for 96 stitches, place marker (marker B), continue round in k2, p2 rib to marker A. Continue working in k2, p2 rib for 1.75”. Change to stockinette stitch (knit every round). Work even until body measures 1.5” from ribbing. Dec round: k1, ssk, k to 3 before marker B, k2tog, k1, sl m, k1, ssk, k to 3 before marker A, k2tog, k1. Repeat these six rounds twice more, then work decrease round once more (total of 4 decrease rows). Work even until body measures 7.5” from cast on edge. Inc round: k1, M1L, k to 1 before marker B, M1R, k1, sl m, k1, M1L, k to 1 before marker A, m1R, k1. Repeat these seven rounds twice more, then work increase round once more. Work even until body measure 13.5 inches from cast on edge. Knit to 5 stitches after marker B. Place the last ten stitches worked (5 on either side of marker B) onto scrap yarn. Knit to 5 stitches before marker A. Place next ten stitches (5 on either side of marker A) onto scrap yarn. Re-place marker A onto righthand needle – this is now the beginning of the round. Using scrap yarn, provisionally cast on 50 stitches for sleeve. PM, then work across back stitches. PM, then provisionally cast on 50 stitches. PM and knit to end of round. Knit 2 rounds even. Decrease round: *k1, SKP, k to 3 before next marker, k2tog, k1* four times. On the last work even round, end round 38 (corrected 08/14/07) stitches before beginning of round marker. DO NOT TURN. Decrease row: k1, ssk, *k to 3 before next marker, k2tog, k2, SKP* four times, k to last 3 stitches of round (center front), k2tog, k1. Turn. Repeat these two rows until front sections have decreased down to the front raglan markers. Bind off all stitches. Place 5 stitches from held underarm gusset stitches onto 16” circular or dpns. Unpick provisional cast on and place next 50 stitches onto needle. Place last 5 stitches from underarm gusset on needle. Place marker – beginning of round is under the arm. 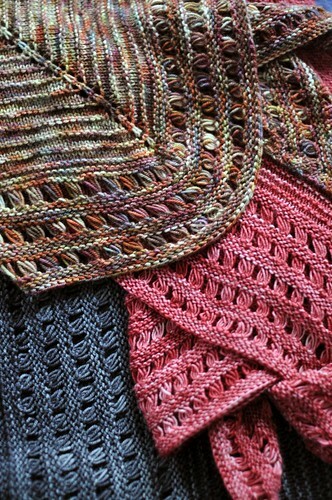 Next round: k5, pick up and knit one stitch, k50, pick up and knit one stitch, k5. Next round: k4, SKP, k50, k2tog, k4. Decrease round: k1, ssk, k to last 3 stitches, k2tog, k1. Repeat these 8 rounds a total of 9 times or until desired narrowness. Continue knitting even until sleeve measures 19” or 1.5” less than desired length. Work 1.5” in 2×2 ribbing (you may need to decrease on the first row to get the right number of stitches for the pattern). Next row: Work in 2×2 rib to 2 stitches before marker, k2tog, sl m, ssk, then work the rest of the V in mirror image to the left side. Work 2×2 rib around rest of collar. Work this round, decreasing every round at centre front stitches for 1” or desired length. Bind off all stitches in pattern. Link freely, but please don’t distribute this pattern. For personal use only. Please email me if you have any problems or to let me know you’re making one!